Rainbow Cake with Petal Icing and Smartie Surprise. This year, for Littlest’s 4th birthday, I attempted my most ambitious cake to date. 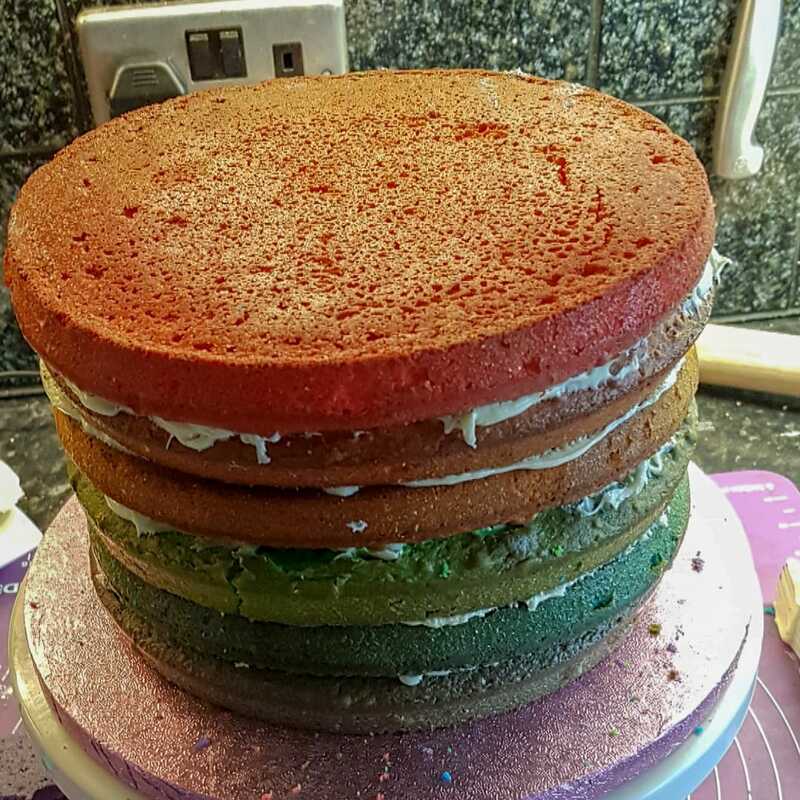 She requested a rainbow cake with rainbow icing and a rainbow on top. I decided to make a six-layer rainbow cake with rainbow petal buttercream, a fondant rainbow on top AND Smarties inside the cake for that extra rainbow surprise. To see how I decorated the cake, take a look at our video. Below, you will also find written instructions and information about the materials for making the cake. You can use this technique to decorate any kind of cake. 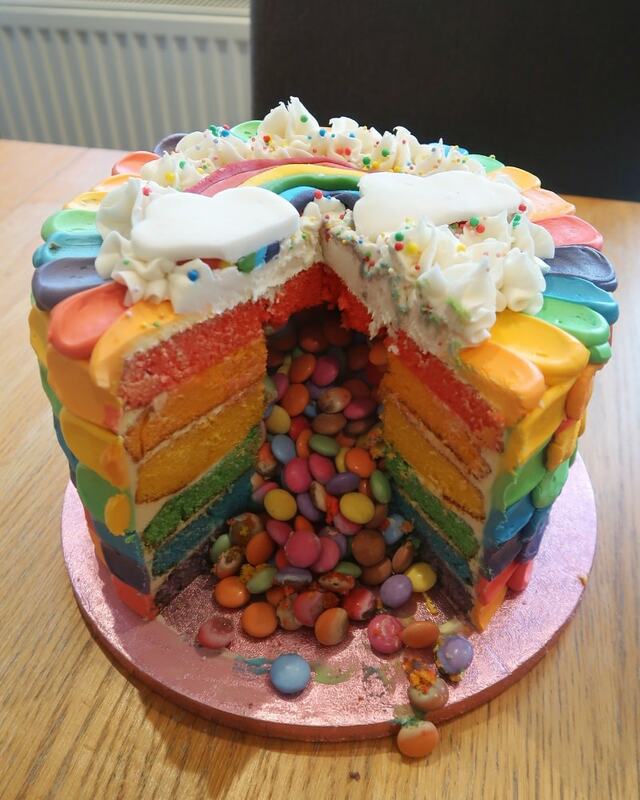 However, if you wish to create a six-layer rainbow, there are many recipes online to show you how. Essentially you will need to make six, 9-inch flat sponge cakes and colour them with gel colours for a more vibrant hue. We use Wilton gel colours. If you are pressed for time or simply feel a bit overwhelmed at the thought of making six cakes, you can use cake mix to make life easier! Most mixes will make two 9-inch cakes. Buttercream icing in six colours, plus some plain. You can make your own but for ease, you could always use premade icing and gel colours again. You will need about 1000g of buttercream in total. Smooth the plain buttercream all over your stacked cake using a piping bag and large palette knife. You will need around 200g of buttercream to cover the cake fairly thinly. You should aim for a really smooth finish. Once covered, allow to chill in the fridge for as long as possible – at least an hour. Snip the end of each pipe with a fairly large hole. Try to ensure that each colour has a similar-sized opening. Tie the tops of the bags in knots and you are ready to ice. Remove the cake from the fridge. Using a toothpick, mark the half-way point on the cake. This will guide your icing. Starting with red, make six round ‘blobs’ of icing in a straight line from the top edge to the bottom edge of the cake. Follow the colours of the rainbow. Smooth each blob into a petal shape with the back of a spoon, taking care to wipe in between colours. On the tail of each ‘petal’ repeat the blobs of icing, this time starting with purple and then moving red. Then, smooth into petals again. Next, start with blue and follow on with purple and red. Follow on in this way so that the petals create a pattern. Carry on until you have iced all the way around. 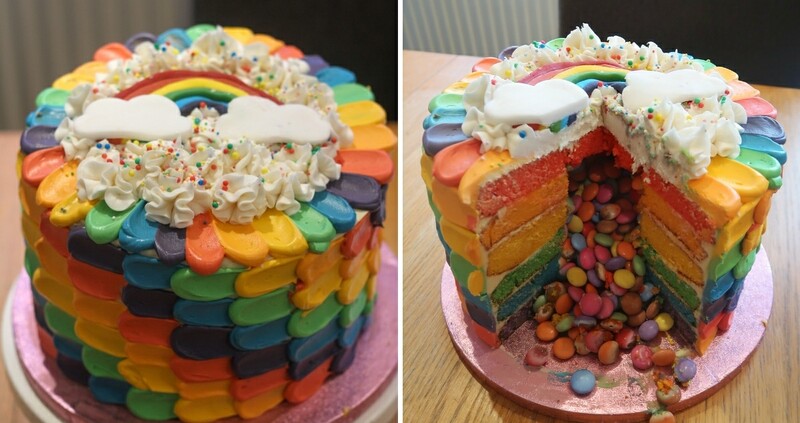 Next, remove the middle section of the cake using a cookie-cutter and fill with Smarties or any other rainbow sweets you like. Return the red cut out to the top of the cake and smooth over the top with buttercream. Create one more set of ‘petals’ around the top edge of the cake. Using white frosting (to look like clouds), pipe flower shapes in a circle on the remaining exposed part of the cake. Sprinkle the ‘clouds’ all over with rainbow coloured sprinkles. 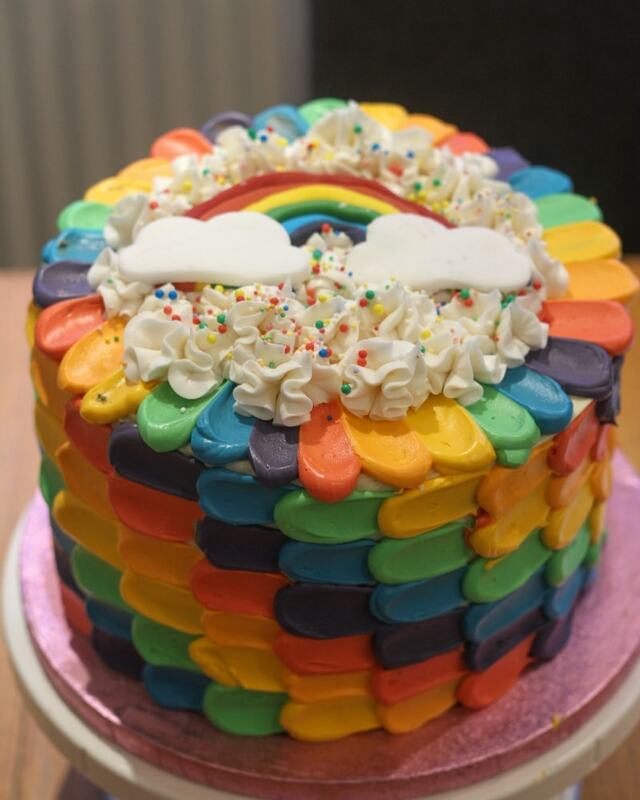 Finally, create a rainbow using fondant icing. I used six colours and rolled them into tube shapes. 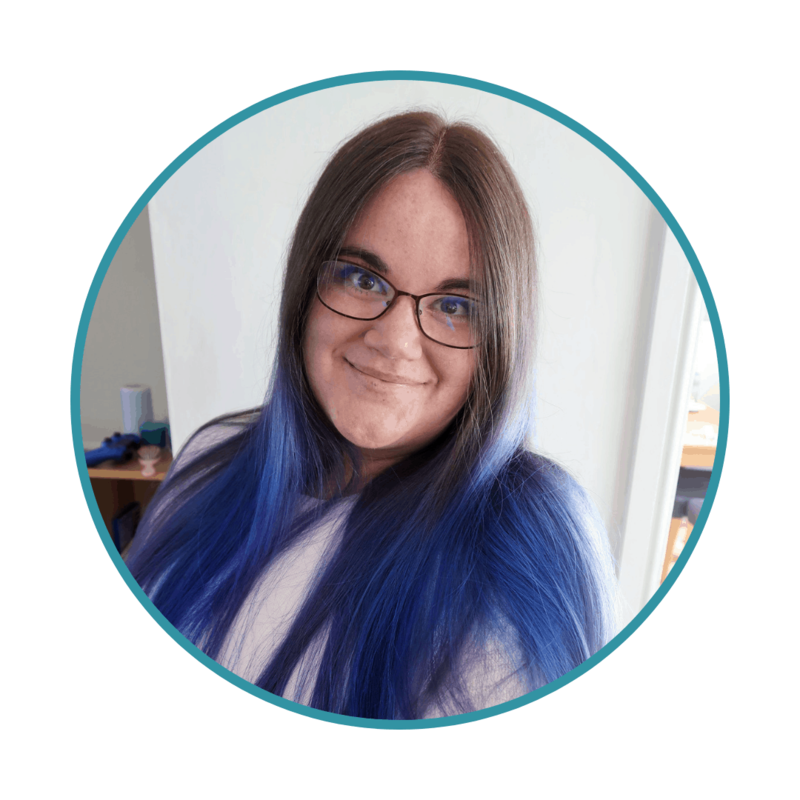 Next, I then created the rainbow on a small round shape (like a shot glass). Lastly, I used white fondant and a cloud cutter to add to each end of the rainbow. You can use water to stick the different fondant parts together. Once I had placed it on the centre of the cake and pushed firmly to check it was secure, my cake was ready. Littlest was really thrilled with it, so it was all worthwhile! Please note, this post contains affiliate links. This means that if you click through and buy something, we earn a small commission at no cost to you. For more information see our Disclosure Policy. Yummy! I can’t believe littlest is already four. Where does the time go? !